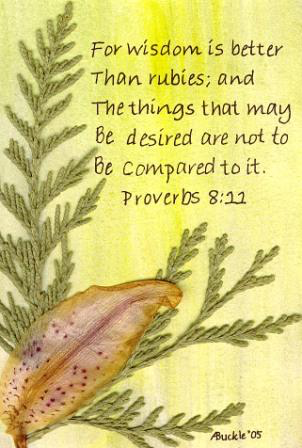 That having wisdom is worth more than silver, gold and precious rubies. That wisdom brings long life, riches and honor, pleasantness and peace. How can we practically apply wisdom in the lives of our children? How do we help our children grow in wisdom? How do we teach them to gain knowledge and think? How do we weave together this important foundation upon which our children will draw for a lifetime? Whether we are holding our first, sixth, or tenth precious bundle, these are important questions to answer. As parents, we have a mandate to train our children. So as we weave wisdom into the lives of our children, picture the process as providing a framework upon which to hang life experiences, insights and inspirations. 1. How can we practically apply wisdom in the lives of our children? The life of Queen Esther whose Hebrew name was Hadassah, comes to mind. One person with two names: one reflecting the society in which she was being raised and the other, Hadassah, was used in her spiritual community. We can surmise that Mordecai, Esther’s uncle, used the principle of line-upon-line, precept-upon-precept, a little here and a little there. With Deuteronomy 6:4-8 as his guide, he was committed to living a life that reflected a relationship with a living God. While providing Esther scriptural truth, he would be encouraging and instructing her to observe his life as he engaged with neighbors and those in authority over him, which meant Mordecai had to experientially know what honoring and worshiping the God of Abraham, Isaac and Jacob, looked like. As parents, we also apply wisdom in the lives of our children by seeing God’s wisdom and helping them see it too. 2. How do we help our children grow in wisdom? The simple answer is by training them, which is accomplished by providing the moral/biblical reason why we are doing what we do. Then we must allow time and circumstances to help mature our children to the place where they trust our parental wisdom and eventually move to owning what has been modeled. Over time, it is important that our children know and understand that as parents, we answer to an Almighty God Who is greater than ourselves. We pray that eventually our children come to the place of understanding that they are not complying to our instructions for our sake, but that they are being trained to walk in a relationship with the Creator of the World. 3. How do we teach them to gain knowledge and to think? Patience!!! As parents we must be patient with the process. We diligently teach, train and, most of all, pray. Pray for opportunities and circumstances that will mold and shape our children. In the Lentz home one of our daughters struggled in school all her life. It was important to be very honest with her and admit that I did not know why this was her struggle, but never for a moment did I doubt that God had a plan and purpose for her life that He would use even what we had determined were deficiencies for His good and glory. While we communicated that truth to her regularly, we also knew it was important that she, along with all our children, saw what it means to seek wisdom and then share the insights and understanding that the Lord provides. Sometimes that understanding comes through a book or an observation, that as parents, we can then share with our children. We also tried to model the struggle of waiting for an answer to prayer and the importance of seeking counsel of an older/wiser person. 4. How do we weave together this important foundation upon which our children will be able to draw for a lifetime? Returning to our narrative of Esther, never in her life could she have dreamed she was being groomed and trained “for such a time as this.” How did she come up with such a clever plan and the courage to confront so powerful a man as King Ahasuerus and then; rat out Haman!? Undoubtedly, during Esther’s growing up years, Uncle Mordecai shared with her about the power and mighty deeds of the Living and Sovereign God and how He acted on behalf of the Israelites throughout history. It is quite possible that Mordecai had also told her about the years of oppression, and persecution her people experienced. Providing a narrative about God’s hand in our family’s life story is another important way to teach children, helping them to gain knowledge. Esther’s courage reflected a healthy fear (respect) of the Lord. Further, Esther found favor in the eyes of important people. She was kind, not a complainer, served others, and went out of her way to make others feel welcome. Esther looked up and around and grew to recognize people she could trust and who would advise her well. Undoubtedly her key interactions were with these people and when she needed advice she knew exactly who to go to. So as we have observed Esther grow in wisdom and favor, as parents we also need to be growing in wisdom and understanding, being that student of our children. In our next CMC we will share another tool that will help us in our journey of parenting: understanding our children’s learning style.